Christmas morning can be a challenging time for a single Jewish guy who wants to go someplace for breakfast. Every year I get in my car and drive up to Pasadena, and I always seem to find at least one place that's open. One year, the bakery next to Mi Piaci on Colorado was open. Another year, it was Robin's. It seems to vary from year to year, and I can't seem to count on any place to be open year after year. Several years ago, as I made my way into Old Town on Christmas morning, I noticed that Ruby's Diner (http://www.rubys.com/) at the corner of Green and Fair Oaks was open. 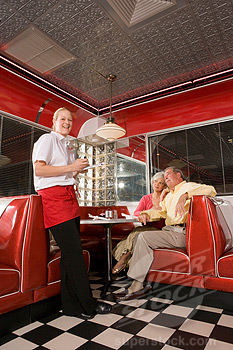 Ruby's was a '50s-style diner that had great food and waiters and waitresses dressed in 50s-style outfits. (It has long since left Pasadena, but can still be found in some other locations like Fullerton, for example.) Sometimes my swing-dancing friends and I would go there in the evening after a dance at PBDA (http://www.pasadenaballroomdance.com/) and dance to the 50s music in the aisles between the tables. I was really happy that Ruby's was open that Christmas morning. Upon arriving, I realized that I needed to buy an LA Times to read as I ate, but decided I'd wait until after I ordered my meal. As I entered, a young woman greeted me and asked me if I was there for breakfast. I thought this was a rather odd question. It was around 8:00 am, so what else would I be doing walking into a restaurant? I noticed that the waiters and waitresses were not wearing their usual Ruby's outfits. Instead they were wearing blue jeans and flannel shirts. I thought, "That's funny, but it is Christmas, and maybe they just thought they'd let them wear regular clothes." I was taken to a booth, and I sat down waiting for someone to bring me coffee and a menu and take my order. As I waited, I noticed that instead of the usual salt and pepper shakers on the table there were those little paper envelopes. I also noticed that the utensils were plastic. I thought, "Well, it's Christmas, I guess they didn't want to bring in a full crew of dishwashers and others." I thought it was odd that it was taking so long for them to come and take my order, when suddenly two young waitresses appeared at my table. One had a pot of coffee and the other had a rectangular styrofoam plate containing scrambled eggs, bacon, hash browns, and toast, which she began to place in front of me. "What's this?" I asked. "It's breakfast," one of them said. "But I didn't order this," I said. Just then a light went on in my head. "Is this a free breakfast for the homeless?" I asked. "Yes," she said. "Oh," I said trying to slide down under the table from embarrassment, "I can't eat this. I didn't realize..." "Don't worry about it," she said, "We have enough food to feed 500 people and only 50 have shown up. We're just going to have to throw it out." So reluctantly, I began to eat my free Christmas breakfast. I looked around sheepishly at the other diners. I saw a few homeless-looking people, and a few large tables of what appeared to be special-needs patients. 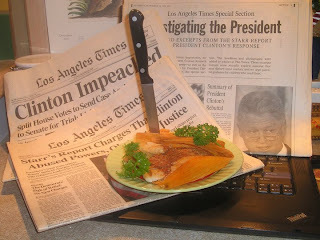 I had to eat my breakfast without the company of the LA Times, because you see, I felt so guilty for being there, I didn't have the nerve to show I had disposable income by getting up and spending a quarter on a newspaper. After I was done, I went over and offered to pay for my food or to make a donation. The waitress said, "There's no way you can. We don't have registers working, and all the food's been donated and paid for. We're just going to have to send all the leftovers to the park where they're serving lunch, but there will be way too much food." So that's the story of my embarrassing Christmas breakfast at Ruby's Diner. 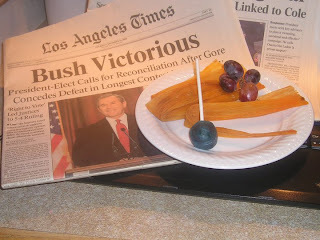 It all started when Facebook Friend Kris decided to present her tamale-party dinner. She placed it on her computer, but used a newspaper as a "barrier" to protect the keyboard. 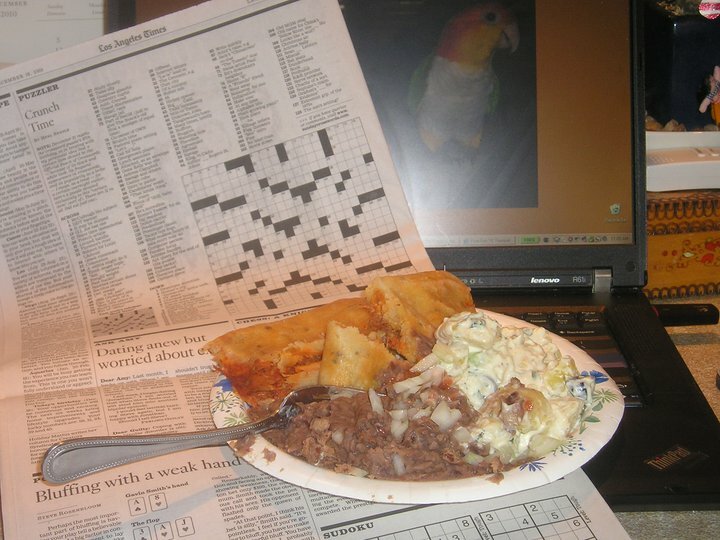 I followed suit with a tamale, a plate, a newspaper, and a keyboard. The Tamale Headline Keyboard Smackdown was on. I thought the Giants World Series Victory was a nice touch. 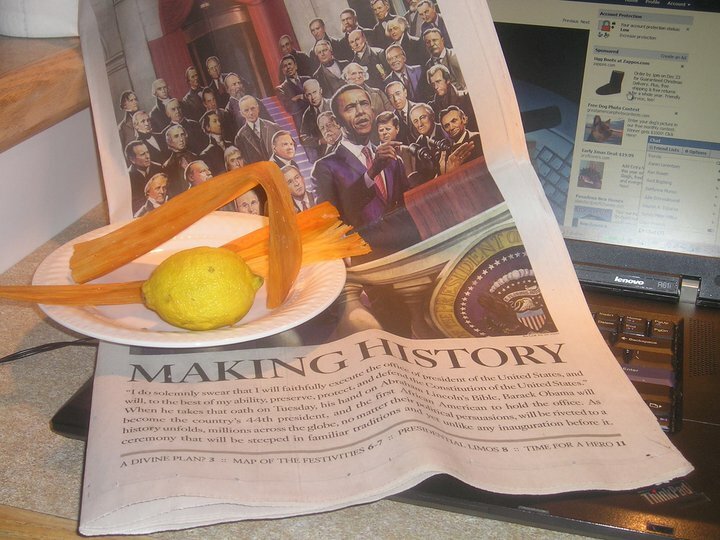 We soon discovered we'd been hoarding some interesting headlines. 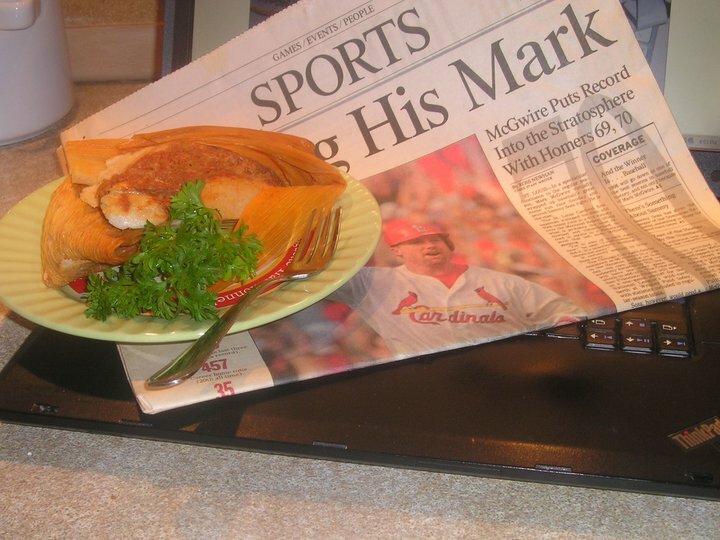 Rules: Tamale (or part thereof), plate, keyboard, newspaper. Which one's the Jesus Juice?